A great high protein start to the day. Put the fish in a cool non-stick frying pan and cover with water. Bring slowly to boil, then simmer until fish is tender but not breaking up. Transfer with a slotted spoon to a warmed serving plate and keep hot. Bring the cooking liquid to a boil. Using a spoon, stir the water very quickly to create a ‘whirlpool’ and then slide the egg carefully into the water. Repeat with the remaining egg. Simmer for three minutes or until each egg is firmly set. Meanwhile sprinkle fish with pepper to taste. 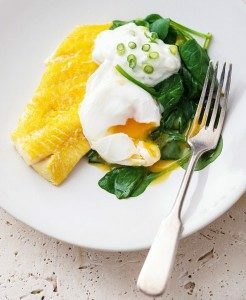 When eggs are cooked, remove from the pan with a slotted spoon and place on each piece of fish. Garnish with slivered almonds and freshly chopped spring onions, spinach and your favorite herbs.